I was up in Cumbria for the weekend, swimming, but that’s another story. Fleetingly, driving out of Great Langdale, I glimpsed the odd sight of a snow covered hillock crowned by a single dead tree. There were sheep beneath the tree, and dozens of rooks standing in the tree and on the sheep. I suppose they were keeping their feet warm. The whole thing was such an odd but picturesque tableau that it deserved a picture, even though I cannot really say what it looked like. 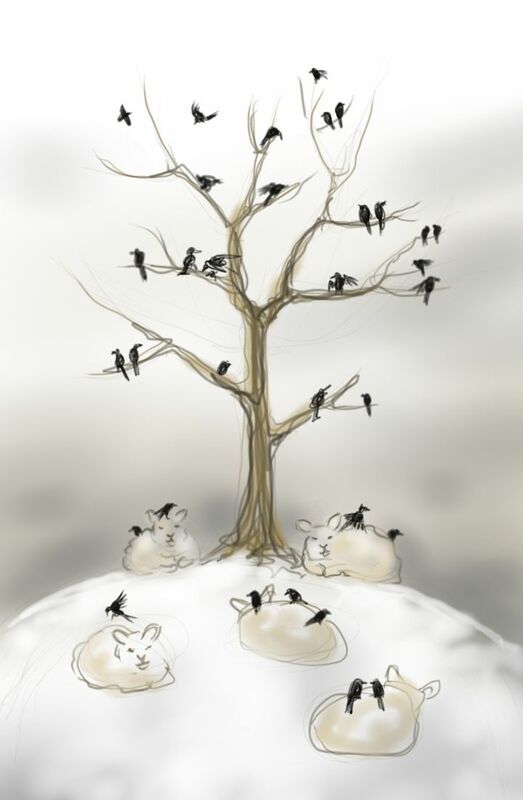 This entry was posted in Birds, Sheep and tagged art, crow, dead tree, digital sketch, drawing, drawing from memory, illustration, Lake District, rook, sheep on February 3, 2015 by Nancy Farmer.